So I love the photo above.. It reminds me of two of my favorite things: Flowers and France.. 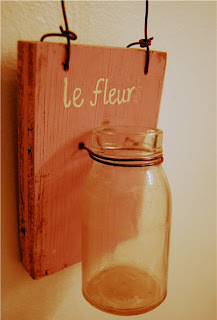 It looks like it would be very easy to craft.. Just a mason jar, wire, piece of plywood, and paint.. and there you have it a simple yet shabby chic vase to hang on the wall or in your garden!